​If you've got squirrels in your yard or garden and you want them, “Outta here!”, you've come to the right place. There's no time like the present, so let's get started! Should You Kill Squirrels In Your Yard or Not? ​How do I Use these Methods? ​How Should You Use Netting and Chicken Wire? First of all, you have to decide on your overall strategy. Do you want to kill the squirrels or simply discourage them from tearing up your yard and garden, thus curing their bad habits? In other words, do you want to kill 'em or cure 'em? There are advantages and disadvantages to both. ​Killing the squirrels is a permanent solution that settles their hash once and for all. In an enclosed area such as an attic or basement where you can control the entrances or gain control over them, killing all the squirrels is downright doable. In an area where you can't possibly control all the possible means of entry such as a yard or garden, you'll quickly discover that they can breed faster than you can kill them. In other words, it becomes a never-ending battle. Discouraging squirrels by means of repellents, barriers, and deterrents to cure them of their habit of tearing up your yard and/or garden is also a never-ending battle. 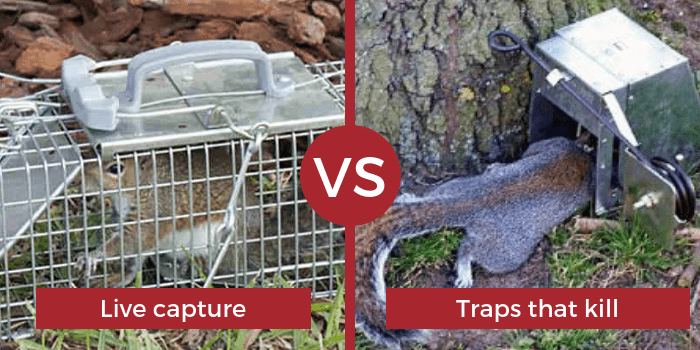 Should You Use Traps For Squirrels In Your Yard? Traps that kill the squirrels come in a wide variety of styles and designs but most feature a box-like contraption that utilizes an attractive bait to lure the squirrels into it. Then a trigger activates the trap and kills them. Old fashioned snap traps are widely available too. ​You'll want to keep some disposable latex gloves on your hand to protect you from the blood and bodily fluids which will be released when the trap kills them. Squirrels also carry fleas and ticks which you want to be aware of. Live capture traps for squirrels also available in a wide selection, although their basic design is somewhat standardized. A wire cage with a hanging trapdoor is set out with an attractive bait inside it. When the squirrels try to get the bait, they activate the trigger which releases the door, catching the squirrel inside. Then you have to figure out what to do with the squirrel. Relocating squirrels so they don't find their way back to your house means you have to take them at least five to ten miles away, preferably further. You must also bear in mind that live squirrels carry just as many fleas and ticks as dead ones, and putting them in your car means putting the bugs in your car as well. Should You Use Baits For Squirrels In Your Yard? Rodent bait for squirrels is usually an anticoagulant poison mixed with an attractant of some kind. Because these baits are poisonous, you'll need to be careful and keep them out of reach of pets and small children. Important Note: tamper resistant doesn't mean 100% tamper-proof. A determined dog or child can get them open if they persist in their efforts, so keep an eye on them. ​The bait boxes can be affixed on trees, rooftops, fences, and other areas where squirrels like to run and play. They'll avoid them at first but eventually, their curiosity will get the best of them and they'll venture inside to try the bait. After that, it's just a matter of time. The advantage here is you generally don't have to dispose of the dead bodies because they usually return to their nests when they start feeling sick. Should You Use Repellents For Squirrels In Your Yard? ​If baiting and trapping isn't your cup of tea, then using repellents and deterrents will be the method(s) you'll have to use. Repellents do exactly what the name would suggest; they repel squirrels with sounds or smells that offend or scare them. Deterrents are usually shields, baffles, or barriers that prevent squirrels from getting past them. Devices that create ultrasonic sounds in the 25 kHz to 80 kHz range are used to repel squirrels with alternating frequencies that irritate or frighten them. These electrical devices can be either solar powered or require an electrical outlet. The effective range of these repellers varies between 50-70 feet depending on the brand, so you'll most likely have to get three or four of them (or more) and plant them close enough together to create overlapping fields. That way you can cover the entire yard. Multiple signals coming from different directions on irregular tempos will create a great deal of agitation in the squirrels. Within 5-6 weeks they'll begin leaving for a less stressful environment.Odors that squirrels find offensive can be found in nature and manufacturers have captured them and bottled them for your use. These liquid repellents, including urine from predators such as foxes and coyotes, are then sprayed around the yard and garden at strategic spots to keep squirrels away. You'll need to re-apply them about twice a week on average to maintain their efficiency, as well as immediately after a heavy rainfall. Since you'll be using these so frequently, you should probably get several bottles at a time. You might get a volume discount, and it'll save on shipping too. Should You Use Deterrents For Squirrels In Your Yard? Methods of deterrence can be baffles over or under bird feeders to hinder their access to the birdseed, area-covering squirrel spikes that will pierce or prick their feet when they try to walk across it, fine mesh chicken wire, and netting. ​Homemade remedies can include thin sheets of metal wrapped around trees and poles to prevent them from climbing it, or alternately, oil can be slathered on poles to make them too slick for the squirrels to climb. 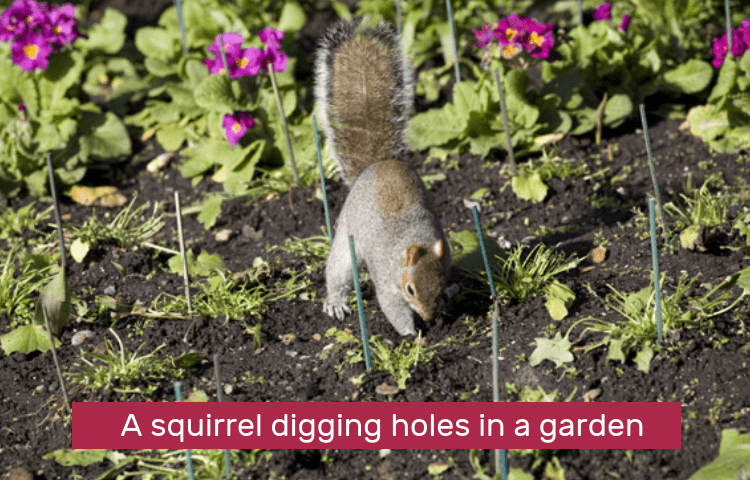 This short video will show you more tips on how to get rid squirrels in your yard or garden. ​Let's start easy and work our way up. Keep in mind that any method mentioned will work for both your garden and your yard, except for netting and chicken wire which are special cases and will be dealt with last. Single-use methods are those which depend solely on one method in particular. Unfortunately, squirrels are smart and adaptable. They learn quickly and no matter how much success you have with one method at first, pretty soon they'll start learning to avoid it and your success rate will drop. Then you'll be right back where you started. If you insist on using a single method, or can't afford to use more than one right now, we recommend trapping. Place the trap or traps near the base of a different tree or pole each time you set them. The variation will keep the squirrels off balance and pique their normal curiosity when they discover them in different locations each time. Trapping also has the advantage of killing the squirrels for a permanent reduction in their numbers. At least until they have more litters. ​Start with trapping around the perimeter of the yard or garden so the trap(s) is the first thing they encounter. Every squirrel that gets killed is one less you have to worry about inside your yard or garden. A lot of squirrels are probably already inside your yard or are gaining access by jumping from one tree to another, so be sure to place a trap at the base of half of the trees. Next, use a liquid repellent between the traps to drive them toward the ​devices for an early demise. Squirrels want to come into your yard – and garden – and will keep hunting for a way in. ​Using the same pattern as combination number one, substitute bait and bait boxes for the traps. ​​Use a combination of traps, bait boxes, and two different repellents in the same pattern as numbers one and two above, but alternate the traps and bait boxes at random. Sun Tzu, in his seminal work, The Art of War, advises us to know our enemy, in this case, squirrels. Their natural inquisitiveness will lead them to investigate each time a trap turns up where a bait box used to be and vice versa. Alternating liquid repellents will further confuse the squirrels, increasing the chances of them being funneled into the areas where you've set your traps and bait boxes. An all-repellent option, this one uses the ultrasonic spikes together with multiple liquid repellents to drive the squirrels away from your hard and garden. The spikes have to stay where you place them. Just make sure that none of them are on the same tempo or beat, thus you always have one or more them sounding while others are quiet. ​Spray the repellents around all the trees and poles in the yard as well as around the spikes. Squirrels will sometimes investigate the source of the irritating noise in an attempt to stop it. Liquid repellents will aid in keeping them away, reinforcing their perception that something bad is taking place and they should head for greener pastures somewhere else. Should You Use Netting or Chicken Wire? ​As promised, netting and chicken wire are special cases and have to be discussed separately from the combination options, although they can certainly be used in conjunction with them. Please be aware, using these items will entail a fairly substantial investment of time and labor on your part. ​If you want to fully protect your garden (or yard or flower beds, but I'm mainly discussing gardens) you can completely enclose it with a wooden frame covered with netting and anchored with chicken wire at the bottom. Use post hole digger to dig holes for fences posts around the garden plot as needed. Carefully identify the number of posts needed by the size of your garden. Set the posts and give them a few days to settle. During that time, dig a trench all the way around the garden, 4-6 inches deep. Make sure it runs along the outside of your fence posts. Unroll the chicken wire and string it around the garden, ensuring that the bottom edge of it is flush with the bottom of the trench. Stretch it tight and nail it to the fence posts. ​Once the chicken wire is firmly fastened in place, shovel the dirt back into the trench and tamp it down tight. Squirrels can dig under a fence but they're not very good burrowers. Now that your base is in place, build a framework of lightweight lattice or two-by-fours all the way over the garden. Eight feet high is probably enough in most cases. After the lattice is in place, cover it with the netting. The lattice (or two-by-fours) and netting will allow rain and sun to get in while the netting keeps the squirrels and birds out. ​And yes, you'll need to build a screen door to allow entry. Be sure the door opens outward and nail some chicken wire around the edges so it extends past the edge and overlaps the fence by about 3-4 inches. That'll keep the squirrels from trying to squeeze through the edges. Once you're done (I warned you it was a lot of work), use some liquid repellent around the door once in a while to discourage them from exploiting that one vulnerability and your garden should be safe. Read more: Click here to learn more about other guides for pest removal. 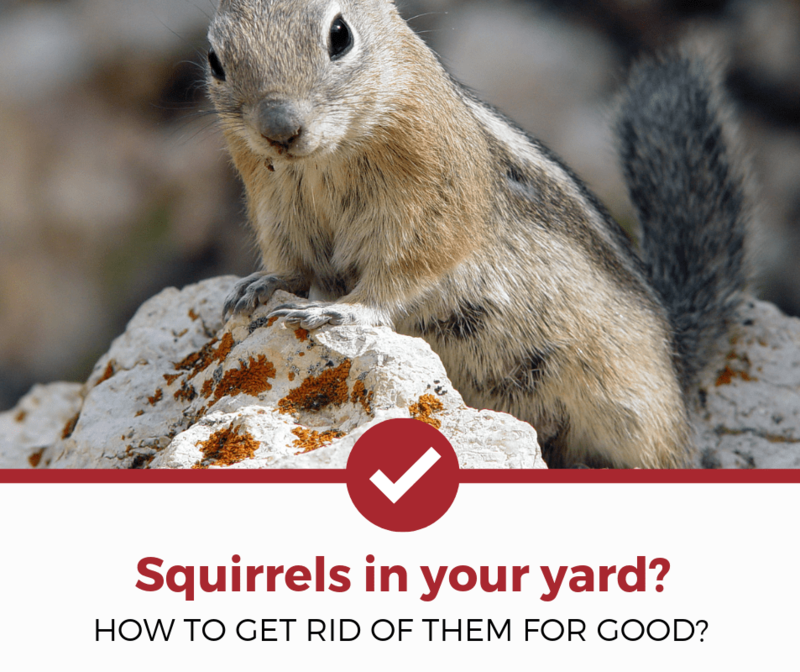 ​We've outlined the major methods of getting rid of squirrels in your yard and garden. However, there's nothing that says you can't develop combinations of your own that might work better on your squirrels. Controlling squirrels is an art rather than a science, so don't be afraid to experiment. Use what we've shown you here as the starting point rather than the end, and you'll be able to tailor combination that will suit your individual requirements.